Are Chinese companies pushing aside their party comrades when it comes to investment in African agriculture? A recent China Daily news article (excerpt below) reported on a China-Africa agricultural cooperation conference held in mid-August 2010 in Beijing, co-sponsored by China's Ministry of Agriculture and the International Department of the Communist Party of China Central Committee. Two things interested me. First, the CCP's co-sponsorship of the conference, which, to me, indicates that agricultural cooperation is still viewed primarily as a political venture rather than an economic one. If it was an economic venture, I would expect to see it co-sponsored by the Ministry of Commerce's Department of Outward Investment and Economic Cooperation. Second, the quotation below from China State Farm Agribusiness Corporation indicates lessons learned from past efforts to invest using "party to party" links. In The Dragon's Gift, I note several other interesting examples of this "learning from failed political aid projects" in Ghana. "The fragile political situation is still the biggest challenge for Chinese companies to invest in Africa," Xu Jun, deputy general manager of China State Farms Agribusiness Corporation (CSFAC), told China Daily on Tuesday. Last year, a cooperative program worth more than 70 million yuan ($10 million) between the CSFAC and Ghana's ruling party came to an abrupt halt when the opposition party took office, he said. "Now we prefer to talk with government administrations instead of party leaders when it comes to further cooperation," Xu said. The CSFAC is one of the country's leading agriculture resources development companies. It started its first farm in Africa in 1994 and now operates seven farming projects across Africa, with more than 8,600 hectares of land. Finally, it is also interesting to see how small, and how few, CSFAC's investments in Africa have been. In a 2003 article on China.org.cn, CSFAC was said to have 11 projects in Africa (some could have been processing) on about 16,000 hectares of land. If these figures are in the right ballpark, CSFAC's investments in Africa have shrunk over this decade, rather than expanding. Greater emphasis on a market rationale rather than a political rationale might be the reason. It seems you don't know China's food policy. China is committed to be self-reliance on major food. Because Chinese leadership don't believe free market in terms of food product, and no country can rescue a 1.3 billion nation when food crisis happens. China now is the largest producer of many food products in the world, and a net food donor under UN. When food shortage happens, government can ban food product from export. That's what happened recently in Russia. I think that's legitimate. Actually every country should produce most of their food if possible and have a plan for food crisis. From where I sit in Abuja, I don’t see the world ready to shift from the obnoxiousness of American hegemony to Chinese super power obnoxiousness, nor to the fascism of primitive Islamists. The mainstream in contemporary Africa wants to be part of a world in which power is exercised with sense of respectable leadership responsibility. 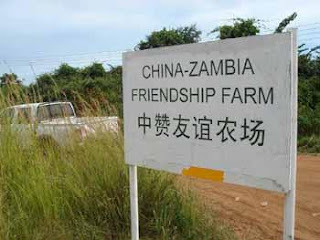 For Africans, as we become more deeply involved with China, while pursuing realization of our aspirations for more perfect democracies, we don’t want to see our major partner in development constantly in conflict with the global mainstream on issues of human rights and non-aggression– such as standing up for North Korea and Sudan. However those of use who have been following Sino-African relations since the Mao era are well aware of China's long term support for Africa since the days of our liberation struggles and from the very beginning of the post-colonial era. Muhammed, your perspective is widely shared among people I've spoken to in Nigeria and elsewhere in Africa. Well said. Addressing the closing ceremony of a China-Africa agriculture forum, Hui proposed enhanced exchanges among agricultural departments and improving the Sino-African agricultural cooperation mechanism. nHe called for strengthened agricultural technological cooperation and an expansion in trade of primary products. The Chinese government will continue to send agricultural experts and technicians to African countries to help spread and apply advanced agricultural technology, Hui said. Is China Sending Prisoners to Work Overseas?